It’s a known fact that I’m a big fan of cheese fries. From time to time, I can manage to turn down normal fries. 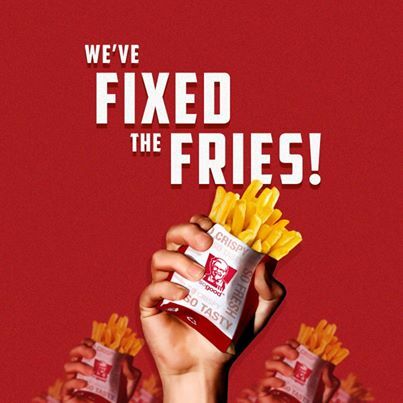 But with cheese fries – it’s a whole new level of love and addiction. I once tried having cheese fries every single day for a whole week, in the hope that I will get sick of it by the end of the week. Well, that didn’t work out. Cheese fries continued to have a hold on me – as though there’s a tiny flag in my heart labelled ‘Cheese Fries’. I was ecstatic but at the same time horrified! Just when I thought cheese fries couldn’t get any better! This is definitely not going to help my addiction. Needless to say, I rushed inside to try the new & improved cheese fries. Filled with anticipation, I picked up a piece of golden cheesy fry and put it in my mouth.. I put a few more fries in my mouth – waiting to feel that unmistakably IMPROVED taste.. but still… nothing! The fries definitely did *not* taste better; in fact, they actually tasted worse! In a way, a similar thing happened with a guy I had been seeing on & off. We kept it casual because I never saw a future with him, but also because I liked things the way they were : casual & uncomplicated. But then he woke up one day and announced that he was going to prove himself worthy of a future with me. He then proceeded to turning himself into a ‘new’ and ‘improved’ person. Some of you may think that’s quite sweet of him. But I felt the same way I did with the new & improved cheese fries : Nothing. I tried really hard to appreciate these ‘improvements’, but the truth is I couldn’t bring myself to enjoy the so-called new & improved cheese fries or… man. Some things in life are better off when left the hell alone.